Hi Jason , would I be able to open an account with a minimum Deposit of £500 for spreadbetting . I am from the UK and I have traded with IG in the past . I was in touch with you on other thread for some issues. Right now the problem I face with FXCM is poor responsiveness. I am from INDIA. I already have a LIVE account with FXCM. I was not traded couple of months. Now I again wish to fund my LIVE account. I sent an email to the account Manager name Supratim ROY(From FXCM). This guy is in touch with me when I open my first account. Day is already gone still no call or email response from your team. As a client do you expect us to follow with your team frequently and wait for few days to make some action. I am still not sure why such a reputed company is not focus on proper customer service. Thank you for letting me know about this, and I apologize for the delay in our customer support team responding to you. I reached out to Supratim asking that he contact. I understand in having reached out to Supratim Roy you would like to speak with someone familiar with your account, but if you ever need immediate assistance with your account our customer support team is available 24 hours a day by phone or live chat. I sent email to both <admin@fxcm.com> and supratim. No response from your team. I don’t think LIVE chat it is working. I have tried to connect through LIVE CHAT. But it always saves as an email. Please suggest to whom should I contact to get the details about my account. I opened an account a couple months ago, but had to withdraw my funds do to personal reasons and not because I was unhappy with FXCM (in fact I look forward to trading with FXCM as my other broker is not quite living up to my expectations). [B]What is a Minimum Balance Fee? Please let me know if I am misunderstanding that text. I see that your email came through to admin and I alerted the support team to provide an answer for you as soon as possible. Thanks for bringing this to my attention. There are is no minimum balance fee in the US. The FAQ you referenced is for accounts with FXCM Japan and I asked our web team to have it removed from FXCM.com since it is not applicable. I’m glad that there will not be a minimum balance fee. Will I still be able to deposit $800.00 even though I removed the entire 2000 to open the account? Yes, if you withdrew all of the funds within the previous 6 months, then you can send funds back to the same account and continue with $800. Thanks for your intervention. Now my account is active. Happy to hear we were able to get it all sorted. I have one more query now. Just realized that I have opened account using FXCM LLC instead of FXCM Market. Wanted to know what is the difference of both the accounts apart from GOLD added in Market. Is there any difference in terms of Spreads, commissions, executions, Margin calls or money transactions etc. Which one will be best to use. My intention is I wish to trade in Gold as well. However I don’t want to lose any benefits which I get in the LLC account which I currently use. Hi Jason, I just saw a youtube video update from “Forex Trading with FXCM” about share CFD trading. I already have a live account with FXCM LLC as USA resident. Can USA residents open accounts with FXCM Market to trade CFDs? If you have more specific questions about your account, please send me a private message with your details, so I can take a look at the settings for you. Nice webinar on CFD trading by Michael FXCM UK on Thursday. A pretty way of trading in stocks, will definitely consider joining after going through a couple more materials on the subject, and perhaps when it is readily available on Trading Station 2.0 platform. 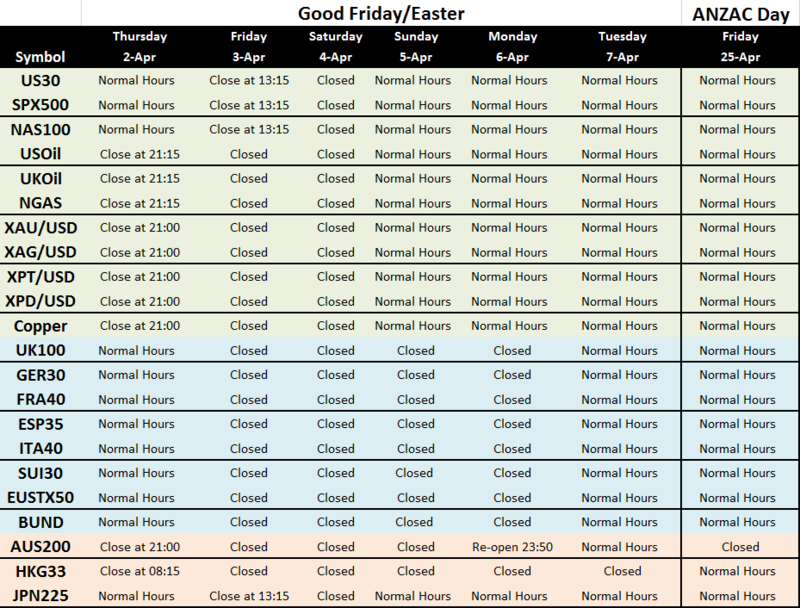 [B]CORRECTION to previously listed holiday trading hours:[/B] ANZAC Day will not have any impact on AUS200 trading hours.